10-1/4’ x 10-1/2” Palestine Feb. 1945, for Town Major M.E.F (Middle East Forces). The face shows the map including 17 keyed points of interest. 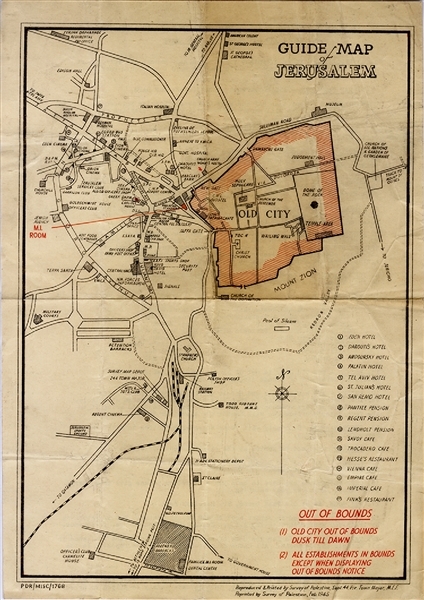 The OLD CITY is shaded n red as is the Out of Bounds” notice. On the back, issued by Town Major Office German Colony Jerusalem, is a 19 point list of “Do’s and Don’ts - While on Leave” including “Don’t risk V.D. ...” Minor wrinkle, else VG.